A number of Italian officials and businessmen expressed their intention to invest in Sultanate after they have been briefed during the promotional campaign organised by the Special Economic Zone Authority in Duqm (SEZAD) in collaboration with the Omani embassy in Italy, on the available investment opportunities in the Sultanate in general and Duqm in particular. 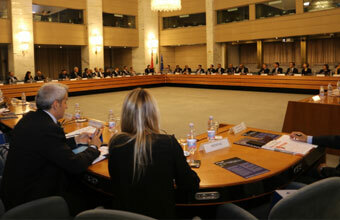 The campaign resulted in placing SEZD on the investment map of the Italian investors and public officials. H.E Yahya bin Said bin Abdullah Al Jabri SEZAD Chairman said that the promotional campaign which was organised in Rome from 22-26 September has been very successful and opened the door for more cooperation between the Sultanate and Italy. \'The Italian officials and businessmen were very responsive to the campaign and many of them expressed their desire to visit Oman in general and Duqm in particular to explore investment potentials especially in fishing marinas, aquaculture, roads, infrastructure , railway and SMEs fields, he added. \'The meetings with the Italian officials and businessmen highlighted how Italian companies can benefit from Duqm strategic location in setting up export-based projects that target Asian markets near the Sultanate. \'Duqm Invites You\' promotional campaign came at a time the reciprocal trade between the Sultanate and Oman hit 576 million Euros with potentials for growth. The number of Italian brands, investors and tourists to the Sultanate has also witnessed remarkable increase in the past few years. \'An agreement has been signed between the two sides to appoint representatives to coordinate about attracting Italian investments to SEZD\', al Jabri furthered. During the campaign, \' the Omani delegation, which comprises representatives of many agencies, held a number of meetings with the officials at the Ministry of Economy, Infrastructure and Transport and specialised companies operating in ports, infrastructure and industry. The Omani delegation also made presentations on the underway and planned projects in Duqm as well as the investment environment in the Sultanate in general. The Omani and Italian sides agreed also to organise a visit for Italian officials and businessmen to SEZD early next year to explore investment potentials. Another delegation will also visit the Sultanate next November in coordination with Oman Chamber of Commerce and Industry. The visit program for this delegation includes a visit to Duqm as well. The Italian delegation hailed the outcomes of the visit and said that they are looking forward for more cooperation in business, economy and investment fields. Carlo Calenda, Deputy Minister of Economic Development in Italy said that the Omani delegation visit to Italy provided us with an overview about the many investment opportunities in Oman. We will urge the Italian companies to set ventures in Oman. He also hailed the good relations between the Sultanate and Italy which should be fostered in the future. Riccardo Nencini Deputy Minister for Infrastructure and Transport in Italy said \' We are looking forward to developing an action plan and taking practical steps that lead to Italian ventures in Oman\'. The Italian executives and businessmen expressed their interest in setting ventures in Oman and said that their visit to the Sultanate during the coming period will familiarise them with the investment potentials in Oman.